I am sharing a sunrise from our neighborhood on Oct 29th, more birds from another Circle B Bar Reserve and some fences for Gosia's European Good Fence meme. 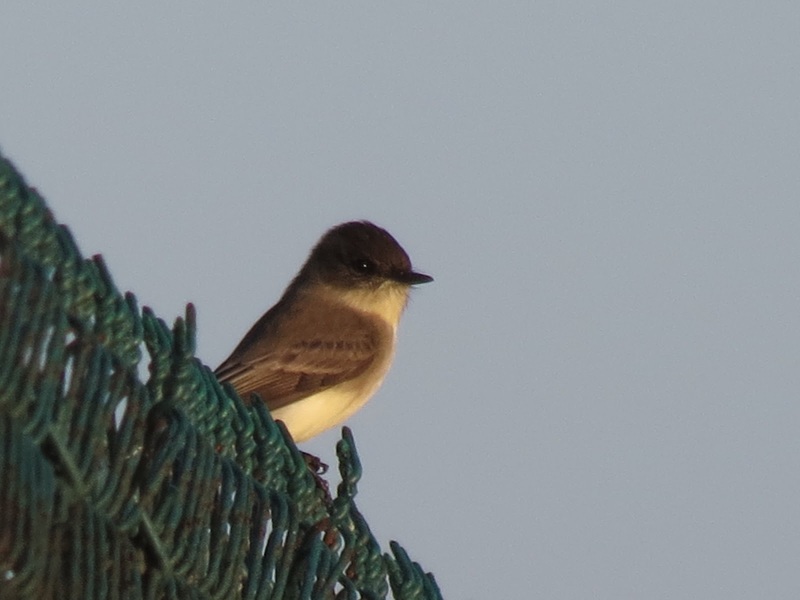 Neighborhood Eastern Phoebe on the fence. Neighborhood Belted Kingfisher on the dock railing. Neighborhood sunrise and some fences around the boat house. Thanks to Gosia for hosting European Good Fences. 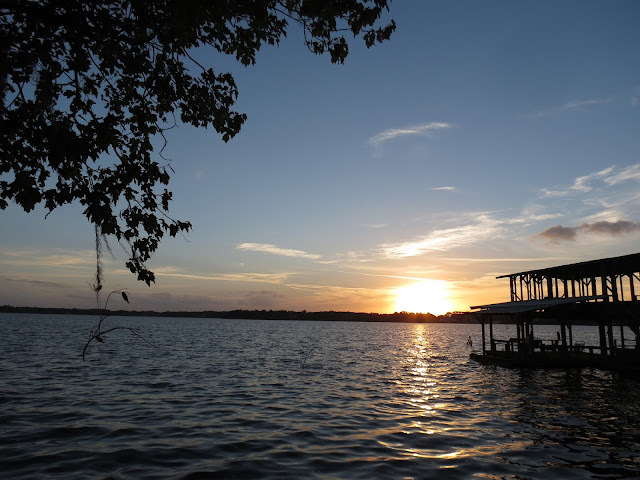 this sundown is even wonderful and the colors are warm and gorgeous. Your bird photos are also amazing, especially the heron. ...a beautiful way to start the day! I always enjoy your superb photos of the birds you see and share and those amazing sunrises across the water! Truly beautiful! Beautiful sunrise. I think the Eastern Phoebe looks sweet and cute! Beautiful photos! Love to see the Osprey and the sunset. the green heron is awesome.. I love that photo. Bar B rocks for up close critters. Great pictures! I will be putting the Tri-Colored Heron on my list of 'Most Wanted to See' next year, as that one has been elusive. Hugs! Good Morning. A beautiful sunrise for sure! And, you captured a pretty pose with the Green Heron. I just spotted a cardinal on one of the bird feeders, but, can't get out there in time for a photo! Darn! Thank you for these nice pictures, and, have a great day! Your photos are wonderful as usual, love to watch them. 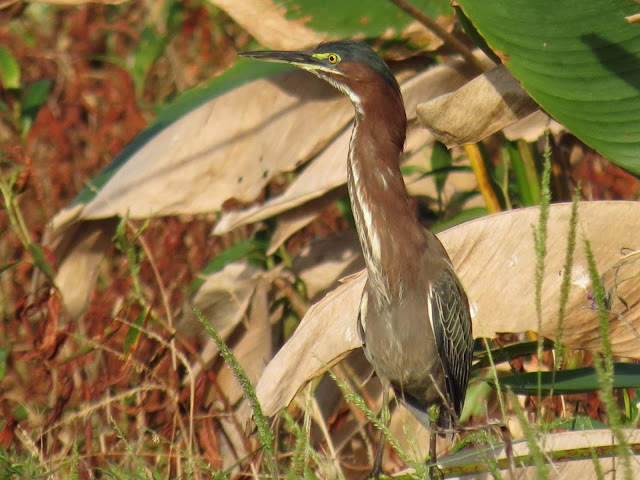 The green heron is of an outstanding beauty I think. Great photos...envy you living so close to the water!! The sunrise is really great. I love your second photo of the bird on a fence. Nice shots of the herons too. what a gorgeous sunrise and so many pretty birds! I envy you seeing all of these birds, Eileen! Beautiful Green Heron shot and I love that sky!! Beautiful birds especially the tricolored heron. Amazing the birds you get shots of! Piękne zdjęcia jestem nimi zauroczona.Serdecznie pozdrawiam. Wonderful birds and the sunrise is beautiful! In my ignorance I thought all herons were blue! Amazing bird images as always. The sunrise is awesome! Great pictures - gorgeous sky shots! Circle B Bar photo beauts . . .
love, love, love your fence capture - and your beautiful herons, you are seeing a nice variety!!! You covered all bases very well. This reserve seems like a gold mine for bird watchers!! Beautiful sunrise..Wonderful bird shots..great pictures all around..Have a fun weekend. Hi Eileen, I sure enjoyed the sunrises and the shots of the birds. Of the bird shots my favorite this time is the Circle B Green Heron on Oct 29th. Love the colors and framing on that one! Thanks, as always, for sharing! Wishing you a happy weekend! Oh, I love come here, and see so beautiful birds and natural thing Eileen. Yes, I definitely did. The last picture -- amazing capture of those colors in the sky. And the pictures of the herons -- quite mind-blowing. Great to see the herons too, I especially like the colours on the green heron. Hope you have a lovely weekend, we are hoping to get the Christmas decorations up! So lovely large birds; and such intense sunrise! Have a lovely day and weekend, as well! You are such a birder!!!! Hi Eileen, My favorite so far today is that Green Heron. Spectacular! Have a wonderful weekend! Stay warm. Gorgeous sky and bird images! Have a beautiful day! Wow .... the birds in this psot are truly amazing. I love these birds and they are really very beautiful!